Use of contraceptive implants has surged in recent years, yet emerging data show a deficit of service delivery capacity and coverage for implant removals. The number of projected removals needed in the 69 FP2020 focus countries in 2018 (4.9–5.8 million) is more than twice that estimated for 2015 (2.2 million). We must proactively plan and execute high-quality implant removal services in order to fulfill the exceptional promise of implants in meeting client needs and advancing toward FP2020 goals. This article was drafted on behalf of the Implants Access Program Operations Group, comprised of representatives from the Bill & Melinda Gates Foundation, the United States Agency for International Development (USAID), the United Nations Population Fund (UNFPA), and the Clinton Health Access Initiative (CHAI). It was established as a working group to proactively and reactively address operational and service delivery issues arising from increased country-level availability of implants. The overall goal of this group is to improve coordination around LARC service delivery, including investigating and addressing country operational issues arising from wider availability of implants in-country and making recommendations for the way forward to appropriate stakeholders. Prevalence of implants (and injectables) is growing faster than all other contraceptive methods in the 69 FP2020 focus countries. Service delivery capacity for implant removals has seemingly not kept pace with that for insertion. With the rapid expansion of implants services, the family planning community—donors, implementers, ministries, advocates, and health care providers—has reached a critical point at which it needs to assure the availability of convenient, quality removal services for clients who want removal for any reason throughout the use of their implant, including those discontinuing contraceptive use, switching to another method, or removing the implant to have a subsequent implant inserted. The family planning community has a responsibility to support method continuation as well as access to quality removal when desired—commensurate to the attention paid to the method’s initiation—such that clients’ reproductive intentions can be realized.9 We need more data visibility into implant removals and adoptable approaches to expanding access to removal services—and it is imperative that we act urgently. WHY THE FOCUSED ATTENTION ON REMOVALS? Implant removal is an essential component of implant scale-up and high-quality service delivery. The sheer volume of anticipated removals in the coming years should give us pause. This unprecedented growth in the availability of implants will result in an equal growth in the need for implant removals in the near future because currently available implants have a 3-to-5-year lifespan. Using publically available data from RHInterchange,2 which has contraceptive procurement data from major donors and international organizations for more than 140 countries, we modeled the approximate timeline and magnitude of this upcoming removal burden (Figure). The bars in the Figure show procurement of implants by year, over the past 10 years, in the 69 FP2020 focus countries. We calculated the lines projecting number of implants due for removal by disaggregating procurement data by implant product, adding a 12-month period from receipt in-country to insertion in a client, and then assuming that once inserted, each product was used for its couple-years of protection (CYP) unit—2.5 years for Implanon, 3.2 years for Sino-implant (II), and 3.8 years for Jadelle.17 For example, a shipment of Jadelle that arrived in a country in July 2008 was modeled for removal in April 2013. A second scenario is also presented in the Figure to account for the possible shift of Implanon’s qualified effectiveness from 3 years to 5 years (represented as 3.8 CYP in the model). This was applied beginning with clients who had an Implanon implant inserted in 2014, with the assumption that current users will be notified that they may keep their implant inserted longer than 3 years. Although the model uses procurement data as a proxy for use, it echoes the previously acknowledged trend of increasing growth in use of implants and conveys overall that with either scenario we will experience a growing number of removals in years to come, as current implant users age out of their implants or remove for other reasons. According to this model, the number of estimated removals needed in 2015 (2.2 million) was less than half the number projected for 2018 by either scenario (4.9 million for the first scenario, 5.8 million for the second scenario)—a worrisome figure if removal issues have already begun to emerge. 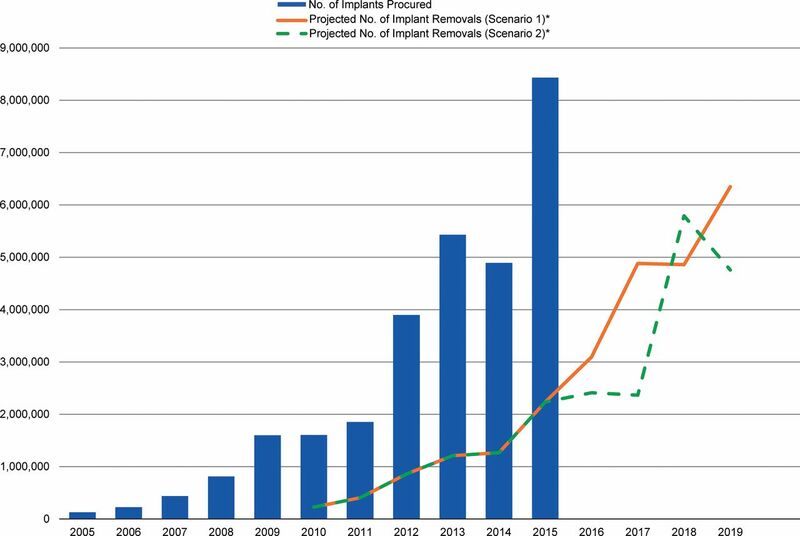 The number of estimated implant removals needed in 2015 in the 69 FP2020 focus countries was less than half the number projected for 2018. Abbreviation: CYP, couple‐year of protection; FP2020, Family Planning 2020. * Scenario 1 assumes that each implant is used for its current CYP unit—2.5 years for Implanon, 3.2 years for Sino‐implant (II), and 3.8 years for Jadelle. Scenario 2 accounts for the possible shift in the approved length of effectiveness for Implanon, from 3 years to 5 years, which would change its CYP unit to 3.8 CYP. Of note, the model’s limitations include: (1) use of procurement data as a proxy for use, (2) the assumption that all implants are used for their CYP unit to calculate the removal projection, (3) use of the general estimate of 12 months to represent the time between the implant shipment’s arrival in country and the product’s insertion into a client, and (4) the exclusion of direct procurement by governments and some other third-party procurement (for example, Indonesia’s procurement) from RHInterchange procurement numbers. Some country programs are implementing innovative strategies to address implant removal. Coordinated and systematic efforts to highlight and implement best practices in expanding access to implant removal services could greatly benefit situations in which implant removals have not received commensurate attention or are only now emerging as a problem area. At the global level, the Implants Access Program Operations Group partnered with Jhpiego to support 2 technical consultations on implant removals. In late 2015, the group initiated the Implant Removal Task Force to bring together implementing partners and donors to identify existing best practices and call attention to research and programming gaps for future action. The task force also aims to bring awareness and ensure adequate attention to the issue of implant removal. While only in its infancy, the task force has already shared lessons learned and identified a learning agenda. In addition, in each of the task force’s 4 subgroups (capacity building and service delivery; data and monitoring; research; and difficult removals), action plans have been developed and new tools, approaches, and analyses are in development to meet the needs of ministries, providers, partners, and donors. As this task force matures, it expects to deliver clear evidence and best practices and offer tangible solutions to those who need them. As a starting point, the task force has developed a short list of requirements of quality, client-centered implant removal services (Box). What Would Quality Implant Removal Services Look Like? Supplies for implant removal are available at the point of service. Provider is competent and confident. Systems are in place for managing difficult removals. Counseling, side‐effect management, and resupply and switching are offered. Client knows when and where to go for removal. Service is available when client wants it, within a reasonable distance. Service is affordable (or free). Removal data are collected and monitored. Source: Compiled from the Implant Removal Task Force of the Implants Access Program Operations Group. Now is the right time to tackle this issue. In this period of rapid scale-up of contraceptive implants, the opportunities for advocacy and action surround us. Whether in the development of costed implementation plans, in updates to heath management information systems, in the actions associated with national FP2020 commitments, or in so many other efforts, each offers the opportunity to address preparedness for, and delivery of, implant removals when desired. Now is the right time to tackle the issue of ensuring ready access to high-quality implant removal services. First and foremost, more data are needed. The great success in implant scale-up has been measured almost exclusively by its uptake, yet monitoring removal is one way to support accountability in providing the full range of an implant service (an area where donors could add pressure by requiring reporting on revisits and discontinuation). To better assess the extent to which this full range of service—including follow-up and removal—has been scaled, programs can employ both traditional tactics, such as including follow-up and removal indicators in facility registers and survey instruments, and new ways, such as innovative monitoring of client access through technology solutions (which could potentially also capture incidence of difficult removals and indicators of quality). Although an increasing number of countries track implant uptake through DHIS 2 and other health management information systems, few routinely track removals; yet systematic capture of data on removals is integral to developing plans and scaling up access to this essential service. So too, we need to better understand reasons for method switching and discontinuation.25 Altogether, these data could offer ministries and program managers visibility into the performance of their family planning programs, which will help them align volumes of insertions with volumes of removals, and could reflect the quality of care within their programs. With this is mind, the data and monitoring subgroup of the Implant Removals Task Force is developing an adaptable tool to assist countries in identifying and addressing implant removal trends and issues. Additionally, where possible globally managed surveys, such as those conducted by PMA2020 and the Demographic and Health Surveys, should incorporate questions on capacity to provide removal services, number of implant removals, their timing of removal in relation to the 3-to-5-year life-of-use, the reasons for removal, and whether the client elected to use another implant or any other method after removal of an implant. Ensure clients are well-informed. Not only should women be counseled at the time of insertion on when, where, and how to access follow-up care and removal,26 but programs should also explore how to make certain this information is available on an ongoing basis and clients are aware when it is time to have the implant removed. Community mobilization, including use of community health workers, as well as social and behavior change communication efforts may be effective here. Support providers to maintain competence and confidence in the removal procedure. We must find ways to overcome the barriers to providers’ ability to perform implant removals, through traditional and non-traditional approaches. Currently, opportunities for clinical practice are limited because demand for removals at training events is relatively low or nonexistent during this phase of introduction or rapid scale-up. This means few providers get the chance to practice in the supportive learning environment of a training. Those who do leave training competent may face low client load upon return to their facility, which leaves them with few opportunities to maintain their skill.7 These factors may also affect the quality of the removal and capacity to identify and manage difficult removals. Reviewing training plans (including plans for client mobilization) and expanding session times on removal practice is a starting point while additional solutions are explored. Plan ways to include implant provision (insertion, follow-up, and removal) within the total health system. At a planning level, strategies, budgets, and costed implementation plans should accommodate the equipment and consumables, human resources, and trainings required to ensure availability of removal services, including ensuring that services are free for the poor or that any fees levied are affordable. While it may not be feasible for every level of the health system or provider offering implants to provide removals, planning will be needed to establish removal services through a referral system or other approaches. Additionally, service delivery approaches that expand access to implants should include contingencies for access to removal services. For example, task shifting and mobile outreach have helped implants meet demand for family planning and penetrate farther into rural and other underserved communities, but these programs must think ahead when expanding access through means that do not guarantee continuous and universal access to a competent provider for follow-up and removal. An optimal approach to expanding access to implant removals likely involves a total market approach that leverages private and NGO partners and uses their comparative advantages to ensure that the needs of all segments of the population are met and that available resources are maximized so the poor and vulnerable are not left out. The current scale-up of implants is the result of coordinated efforts on the part of many groups and individuals, including providers, seeking to sustain the expanded choice of methods presented by implants. To prevent the ongoing scale-up from being undermined, further investment and efforts to measure and expand access to implant removal are needed, and the timing is right. We also call on advocates to aid in focusing efforts and refining our “asks” at the global, national, and subnational levels, such that change can be achieved thoughtfully and efficiently. The Implant Removal Task Force is poised to play an important role in collecting and disseminating knowledge on this topic; we encourage all parties engaged in contraceptive implants provision to look carefully at all aspects of providing quality removal services—the client, the provider, and the system—and take swift action to ensure the availability of quality implant removal services. Critical contributions and review and were provided by the following individuals (in alphabetical order): Elaine Charurat (Jhpiego), Lila Cruikshank (Global Impact Advisors), Ricky Lu (Jhpiego), Patricia MacDonald (USAID), Julia McDowell (CHAI), Elaine Menotti (USAID), Sandra Novo (UNFPA), and Renee Van de Weerdt (UNFPA). Additional support was provided by Lindsay Breithaupt (Jhpiego) and Elizabeth Thompson (Jhpiego). Cite this article as: Christofield M, Lacoste M. Accessible contraceptive implant removal services: an essential element of quality service delivery and scale-up. Glob Health Sci Pract. 2016;4(3):366-372. http://dx.doi.org/10.9745/GHSP-D-16-00096. This is an open-access article distributed under the terms of the Creative Commons Attribution License, which permits unrestricted use, distribution, and reproduction in any medium, provided the original author and source are properly cited. To view a copy of the license, visit http://creativecommons.org/licenses/by/3.0/. When linking to this article, please use the following permanent link: http://dx.doi.org/10.9745/GHSP-D-16-00096. Implants Access Program Operations Group. Meeting report: consultative roundtable on access to implant removals in the context of responsible scale‐up. Oslo (Norway): IAP Operations Group; 2015.